My little sister used to live on Marchmont Road and ever since the Birchwood took over from the previous cafe (which I believe was simply named Toast) I've been dying to check it out. Since she moved we've rarely been down that end of town, but we took the opportunity (since I had won some free donuts from the nearby Deadly Donuts) to head down there last weekend. The Birchwood is pretty small and doesn't often take bookings so it's quite hard to get a table, and we only got lucky getting the one we did (even though we had to squeeze 3 onto a tiny bench). With it being small and pretty packed it does tend to be pretty noisy, but let's be honest it is pretty rare to find little cafes in Edinburgh that aren't loud and busy on weekends. 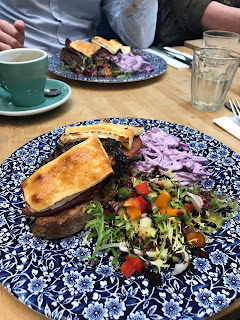 The over all décor is cute but what I loved most was the beautiful blue and white floral patterned plates your food comes out on – really makes a change from boring old white. 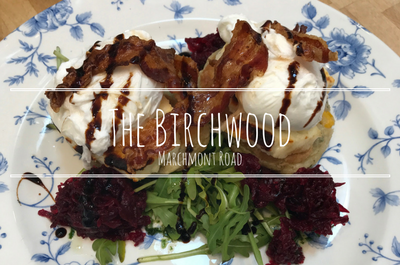 The Birchwood's day time menu features some absolute brunch classics including full Scottish breakfasts (and a veggie friendly alternative), eggs benedict, french toast and homemade pancakes. 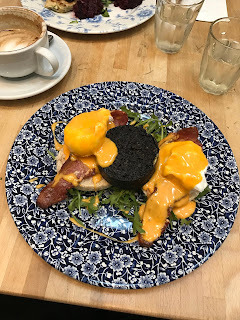 But there are also some pretty unique brunch combinations that have me eager to head all the way to the other side of town just to try. I had the 'Savoury French Toast' which comes in two options; goats cheese, pesto and roast peppers or ham, caramelised onions and brie. It was a pretty tough choice but I went for the brie. It was a really unexpectedly good combination of flavours and the perfect balance of sweet and savoury that I personally crave in my brunch. The brie on top was grilled, but I couldn't help but think it would work well as a sandwich... sandwiches in general should just always be made with french toast (who's with me?). Now I'm not normally one for a side salad. I'm quite particular with salads and don't often order them when I'm out because I made pretty good salads myself. That being said, I loved the side salad here. When it first arrived I thought 'that looks pretty but I won't be eating that'. Especially because there was coleslaw. I hate coleslaw despite my love for mayo, but I loved this purple one. Maybe I've finally been converted to coleslaw (thanks Birchwood chef)! My sister and mum both ordered the 'Sweetcon & Herb Fritters' that comes with grilled halloumi, crispy pancetta, beetroot salsa and poached eggs. I was a little bit jealous (until I tucked into my own meal) as this kind of thing is right up my street. It looked like a unique take on an eggs benedict and they both really enjoyed it. My dad ordered another alternative eggs benny, 'the King Benedit' that adds a hunk of black pudding alongside the bacon. Those who like a bit of a kick to their food will love the sriracha hollandaise sauce on this. I'm definitely keen to come back to the Birchwood and try more of their menu. They've even made a cheesy beano fancy ('Mr Beans' is homemade beans on toast with grilled chorizo and melted cheddar). I'm also keen to come back and try out their evening menu as I noticed they had weekday '2 courses for £13 with a glass of wine' deal. If I lived in the area it would definitely be one of my go-to brunch places and I'd highly recommend a trip (and order the Savoury French Toast). Check out their website for their menu.